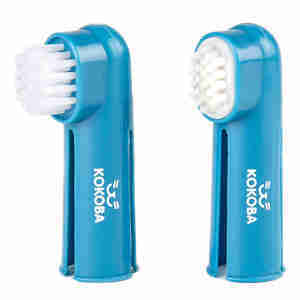 The Kokoba toothbrush set is a practical two-piece toothbrush set that will help you clean and look after your pet's teeth and gums. The set contains two brushes to target different areas of your pet's mouth. To use them, simply insert your index finger into the hole of the brush and then gently rub your four-legged friend's teeth and gums. The first brush in the set is made from polypropylene bristles that can remove leftover food from between the teeth and prevent the build-up of plaque and tartar. The second brush is made from rubber which can be used to massage your pet's gums to help improve blood circulation in their mouth. Paying close attention to your pet's oral hygiene is fundamental to maintaining their overall health and wellbeing. Plaque and tartar can lead to further infections, so it's always a good idea to talk to your vet if you're concerned. easy-to-handle brushes that are used like extensions of your fingers. Looking after your dog’s teeth and gums is as important as making sure your four-legged friend is regularly exercised. Bacteria that lives in plaque and tartar can be easily transmitted to your dog’s kidneys and stomachs which can weaken your furry friend’s immune system, making them more vulnerable to illnesses. Regularly brushing your pet's teeth and gums with a set like the Kokoba as part of their weekly routine helps to reduce plaque and tartar and promote good oral hygiene.